Please email us at events@icsa.org.uk if you have any questions about this year's event, or reserve your table online. Nominations are open for the 2018 Awards. Enter now and Let us know your top talents and achievements. The best annual reports are easy to read, giving a ‘warts and all’ review of the year with real insight into the company as well as its strategy, how its board behaves and how it manages risk. All of tonight’s winners in this category were transparent with distinct absence of boilerplate and vividly told their company’s story in their own way. Congratulations to the winner of the Annual Report of the Year in the FTSE 100 category, Land Securities Group PLC. The Judges here were also very impressed with the Annual Report from Marks and Spencer Group plc and for that, they have been highly commended. Well done M&S. Congratulations to the winner of the Annual Report of the Year in the FTSE 250 category, Spirax-Sarco plc. Congratulations to the winner of the Annual Report of the Year in the Small Cap and AIM category, Dialight plc. Congratulations to Barclays PLC on winning the Audit Disclosure of the Year award. Here, the judges were looking for a detailed description of the process of risk governance, how that process is tested and how control measures are linked to company strategy. The best reports in this category describe in a meaningful way the real risks that the company face and how the board committees play their part. 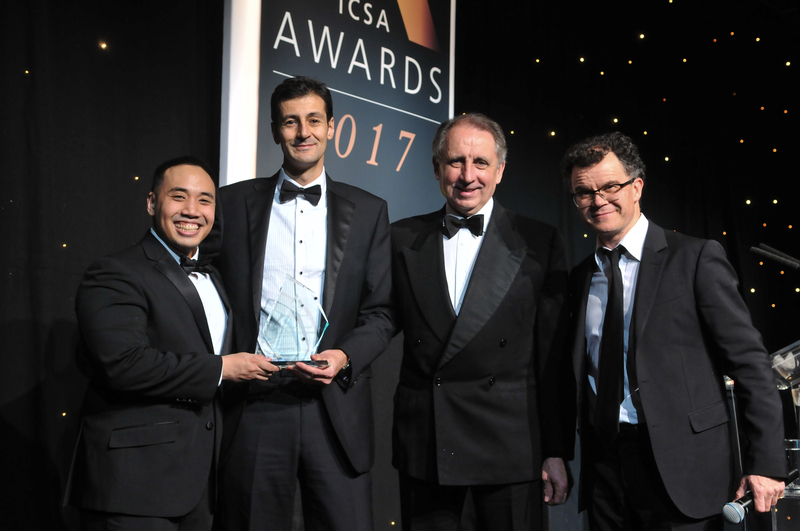 Congratulations to the winner of Risk Disclosure of the Year, Standard Chartered PLC. The judging criteria here was very simple. We contacted the company secretaries of all FTSE 350 companies and asked them to nominate the investor who has been responsible for the most constructive engagement. Twenty one investors were nominated for this category and the shortlist comprises of the four with the most nominations. Congratulations to the winner of Best Investor Engagement, Legal and General Investment Management. The Judges also highly commended Columbia Threadneedle Investments. Well done to them. In this category, the judges wanted a descriptive and reasoned explanation about how the board leads the company. This will include the work of the board’s committees and stakeholders’ interests with clear links to the company’s strategic purpose. Congratulations to Marks and Spencer Group plc for winning the Board Disclosure of the Year award. In this category, the judges were looking for a clear explanation and analysis of the strategic issues facing the company, including its business model, key drivers, objectives and risks. Congratulations to Vodafone Group Plc for winning the Strategic Report of the Year award. In this category, the best reports showed how remuneration was considered alongside the long-term interests of shareowners and how effective remuneration policy can affect positive change in organisational culture. Congratulations to BAE Systems plc for winning the Remuneration Report of the year award. The judges would also like to recognise Berendsen plc as highly commended for their excellent remuneration report. The judges in this category were looking for evidence that long-term stakeholder interests and non-financial factors were linked to the company’s strategy, its objectives, its governance structures and ultimately its sustainability. The overall quality in this category was very high so in an unprecedented move the judges decided to award two winners in this category. Congratulations to GlaxoSmithKline plc and Unilever Group for winning the award for Sustainability Disclosure of the Year. Winner: Sarah McLaughlin - Allied Irish Banks, p.l.c. For this award, the judges were looking for a company secretary who provides effective team and thought leadership, who shows mastery of the complex legal and regulatory environment and plays an added-value role in the governance of his or her organisation. Sarah McLaughlin - Allied Irish Banks, p.l.c. Congratulations to the Company Secretary of the Year, Sarah McLaughlin of Allied Irish Banks, p.l.c. There was one other highly commended nominee in this category and that was Tabitha Kassem from Network Homes Limited. Well done Tabitha. The nominees here are individuals who are at the centre of the governance team and have built and sustained strong relationships with stakeholders, and demonstrated some innovative and effective approaches to good governance. Congratulations to the Governance Professional of the Year, Katie Hollis of Pension Protection Fund. The winners in this category contributed significantly to their organisation’s success. The range and diversity of the duties and transactions which they undertook meant that they have implemented innovative solutions to cope with both routine tasks and the challenges of more exceptional projects. Congratulations to LV= for winning Team of the Year. Highly commended in this section was the team from Standard Life Aberdeen. Well done all of you. This was open to those individuals or companies who have completed a significant governance project in the last 12 months. All of the nominees here delivered a project that was transformational to their organisations. 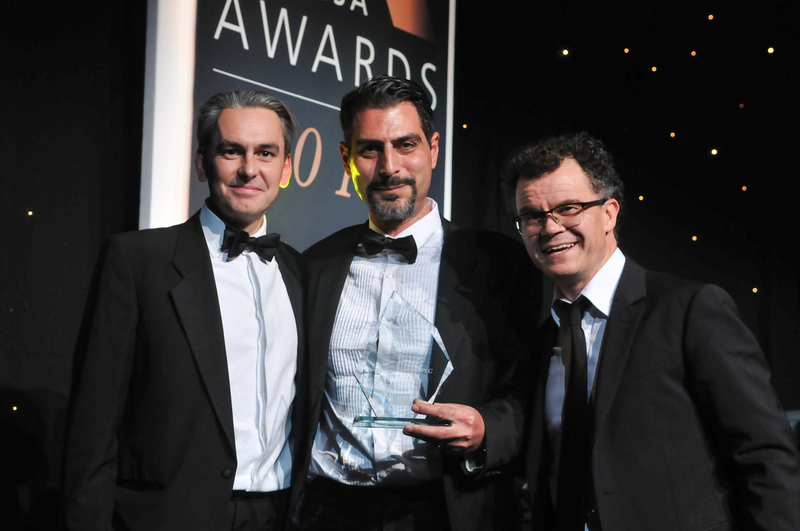 Congratulations to Coca-Cola European Partners plc – Project Apollo for winning Governance Project of the Year. This category was designed to recognise the work of individuals and companies who provide secretarial or governance services to other organisations – particularly those that have gone significantly beyond a basic service to provide a more valuable contribution. Congratulations to Prism CoSec Limited for winning Service Provider of the Year. There was one other highly commended nominee in this category and that was Burness Paull LLP. Well done to them. This category identifies the stars of the future. All the nominees here are still in the early stages of their company secretarial or governance career but have the potential to go all the way to the top. Congratulations to Natalie Gracey of Scottish Widows for winning The One to Watch. The Judges had another difficult decision to make here so they would also like to recognise Naomi Rogers from Janus Henderson Investors as a highly commended nominee. Well done Naomi. 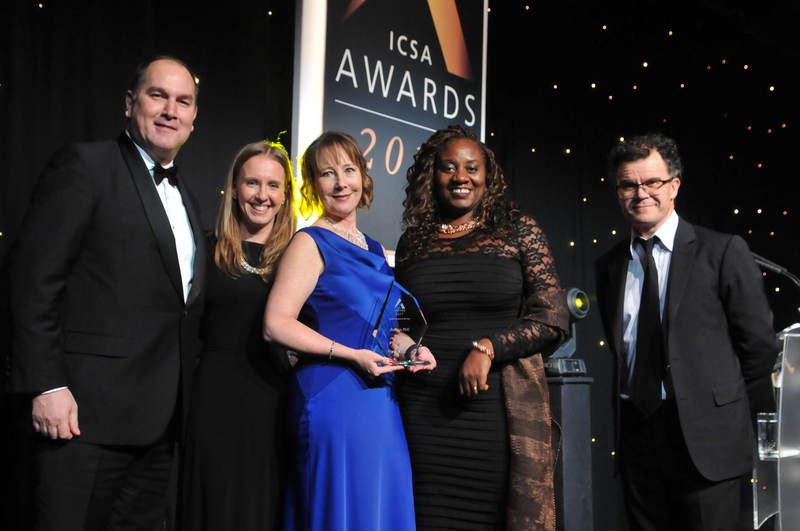 This is a very special award, one which is presented by ICSA in recognition of continued exemplary work in the secretarial and governance fields. Congratulations to this year's winner of the Outstanding Achievement Award, Paul Druckman. This award was received by Alan, the son of Paul Druckman, on behalf of his father as he was unable to attend the awards.